An interesting letter appears in this week's Yated. A writer from Lakewood writes to complain how every time a cousin or someone else makes a simcha in Brooklyn, that the Lakewood residents are expected to travel the two to three hours (and incur the costs) that it takes to get to Brooklyn. 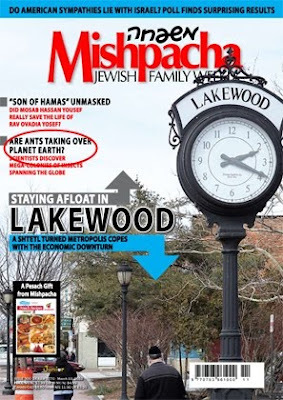 Since when did Lakewood become one of the five boroughs of New York City? “Huh?” you want to ask me. “Who said it is? Well, I’ll tell you who said it is. It seems, based on current custom, that for every event - wedding, bar mitzvah, bris, sheva brachos, etc. - held in Brooklyn or anywhere else in New York for that matter, those who live in Lakewood - young couples and older families as well - are expected to commute. I find that ridiculous. Who decided that people should be traveling for at least 2-1/2 hours to attend every simcha of every cousin? Besides for the shlep, how about the impossibility of getting a babysitter? Does anyone know how hard it is to find a babysitter? And of course, the babysitter will take good money for her services, which she deserves. Add the cost of gas and tolls, and basically, you have young couples, who live on shoestring budgets in the fi rst place, shlepping to New York at a cost of at least $65-70, to say mazel tov to their disinterested uncle and aunt at their cousin’s wedding, and barely get to eat a cold piece of halfbaked chicken if they even make it for the main course. I am sorry, but this is not normal. I know a yungerman who he has limited income. He is smart and careful about how he spends his money, and he and his wife get by okay, boruch Hashem. Recently, however, he told me that he had to travel in to New York for three simchos of cousins, at a cost - all in one month - of a total of over $300, which he cannot afford. (He learns in a paying night kollel and had to give up the money he receives as well.) And for what? “At one simcha,” he told me, “the baal simcha (his relative) barely gave me the time of day as I wished him mazel tov. I imagine he realized who I am, but I wondered why I even came. But the reason why I traveled,” he said, “was because if we wouldn’t come, my parents, and especially grandparents, would be upset. It has to stop. Couples who have young children, or even older children, cannot be expected to travel in to New York - or anywhere else that requires multiple hours of driving - for every simcha. It is not fair to the young couples, and it can potentially affect their wellbeing and their shalom bayis, not to mention their finances. I would add that, similarly, those living in Brooklyn or anywhere else should likewise not be expected to travel for over an hour to Lakewood or any other place for a simcha of a non-immediate relative. It is time we bring back sanity into our lives and put a stop to the unreasonable expectations and demands that we have allowed to become part of our culture. Thank you for your letter. I can certainly understand why you would be upset. Traveling a long distance to go to a simcha can be an arduous and sometimes expensive proposition. And, in this day and age when everyone's watching the purse strings, I definitely understand why you would be upset at having to shell out major money for what might turn out to be a mediocre night at best. But there was one thing about your letter that left me a bit confused. Is there a police force in Lakewood that forces you go to affairs in Brooklyn and other far away places? I don't mean to be facetious, but I'm wondering why you simply cannot just say no. I know that I love to go to family affairs. I go just about every opportunity that I can. But I also know that there are times that I simply cannot go. Sometimes it interferes with my work or school schedules. Other times it is just costs too much (financially) to go. And sometimes, it's just not practical -- maybe it's a work night and I know that I'm not going to be up to four hours of round-trip travel time. When this happens, I send the ba'alei simcha my heartiest mazal tov and tell them that while I would love to attend, I have to give my deepest regrets that I simply cannot make it. Believe it or not, people can and will understand if you cannot make it to a particular simcha for one of the above reasons. People understand that sometimes costs cannot be borne (whether they be financial or logistical costs). And, truth to tell, if the ba'alei simcha are stubborn enough not to understand, then perhaps it's their attitude that needs to be adjusted. If they are selfish enough to "guilt-trip" you into spending money, time or effort that you cannot afford, then perhaps you might want to reconsider how much you want to associate with them. Personally, I would prefer to spend my time with people who are more empathic to my needs and abilities, rather than be so self-centered to demand that everyone attend to them whether they have the means to do so or not. You write that the yungerman in your town goes to please his parents and grandparents. I can certainly understand that. But even parents and grandparents can be made to understand the fact that you simply don't have the funds or the ability to travel to every family simcha. They may not be happy about the situation, but they can understand. There is one additional point I would like to address in your letter. You write about going to a wedding "to say mazel tov to their disinterested uncle and aunt at their cousin’s wedding, and barely get to eat a cold piece of halfbaked chicken if they even make it for the main course." Personally, when I go to a simcha, I don't care if I get a half-baked piece of chicken or not. When I attend a family member's or friend's simcha, my main goal in going is to be m'sameach (make happy) the participants. (I also have a secondary goal, as an amateur shutterbug, of taking as many family pictures as possible -- but that's just my personal mishugass.) I also understand that at a large affair with many people, the ba'al simcha may not have more than a few seconds to give me a quick "Mazal Tov, I'm so glad you could come." In short, I've learned that the wedding or bar mitzvah or whatever is not about me -- it's about the ba'alei simcha. Would it be nice if they could spend a whole ten minutes with me? Sure -- but when there are over fifty guests, it just becomes impractical, if not impossible. In short, I don't go to a simcha with the idea of "what am I going to get out of the simcha?" My goal is "how can I contribute to the simcha?" If I get nothing out of it (or even just a half-baked piece of chicken and only two seconds with the ba'alei simcha) so be it. Every so often, when you argue with people, you run across one or another logical fallacy. Some logical fallacies, such as the ad hominem attack, are fairly easy to spot. Others may be more difficult. One type of fallacy that you see often is the false analogy (or weak analogy). This happens when a person tries to make his/her point by comparing one case to another where there is often an important difference in the two cases. I ran across this today in a report on Matzav.com. A few months ago, a number of female employees filed suit against B&H photo, claiming discrimination because women were barred from certain sales jobs. The story was revived yesterday when three more female employees joined the suit. I want to stress that I have no idea if the suit has merit or not. I don't work at B&H, nor do I visit there too often. As you might expect, when a story such as this comes up, there are those who think that it's wrong that B&H can be sued for gender discrimination. They usually make a point about how it's a private business and that they should be able to hire/fire whomever they like. This lawsuit is outragous! What total nonsense! B&H photo is a private company. What if a man would try to get a job in a shaitel store, dress shop, etc… What about a lady teaching 9th grade gemorah class? Use a bissel sechial. This is total MESIRA! Putting aside his initial outbursts, the point he's trying to make is this: Firms should be allowed to hire/fire whom they want. If the government interferes with that (via laws against discrimination) then they could force a sheitel store to hire a male employee which, in the frum world, would completely destroy the business (as the married women will not shop there). In other words, Hesh is making an analogy between B&H and a sheitel store (and a dress shop and a boys' yeshiva). However, the analogy isn't a good one. In fact, it's a pretty bad one. The reason why it's a bad analogy is because there is an important difference between the cases he brings and B&H. Hesh is probably correct in his statement that forcing a sheitel shop to hire a man would be incorrect. As I pointed out earlier, it would ruin the business as women would not shop at the store anymore. The same can be said for a dress store. Likewise, in many segments of the frum community, the parents would pull their sons out of school if a woman taught gemara. However, the same cannot be said about B&H. B&H's business will not be harmed by the presence of female salespeople. The vast majority of the people who shop at B&H care about the price, selection, warranty and the company's great reputation as a photographic equipment store. They don't care about the gender of the person behind the counter. And that's all the difference. The stores in the examples that Hesh provides have a legitimate business need for a specific gender employee. B&H does not have a specific business need for male-only salespeople. And that's why the analogy fails for Hesh's argument. My Goodness... I Didn't Expect That. I've got to say, when I asked for opinions, I certainly didn't expect that. All I was really looking for was a simple "yes, they're justified in asking" or "no, they're over the line." I certainly wasn't looking to cover how charity recipients ought to spending their free time/money. For the record, I hate closing off debate on a matter. I happen to love a good debate and will be more than happy to argue almost any issue, provided it's done in a civil and polite manner. Apparently, for some people, that wasn't possible. The fact that people who know me in real life felt the need to intervene also factored into my decision to close off comments. For the record, I don't owe anyone on this site an explanation on my finances and personal situation -- the specific question I asked does not require me to justify asking for a tuition break. Nonetheless, I would like to make a few points. Firstly, as most people are well aware (and as was made amply clear in the comments to the previous post) a full-tuition payer pays not only the tuition for his/her kid/s, but also helps to subsidize the cost of someone else. If one asks for a break down to the true cost of educating one's child, they are not "taking charity;" they are merely asking to be excused from *giving* to that particular charity. Not nice? Maybe -- but it's still not actually taking charity money. That being said, I don't know what the true cost of educating my kid is. Neither, for that matter, do I think that anyone outside of the financial office of a school. Is my request beyond that point? To be fair, I don't know -- but if it is, it's probably not much beyond that. For those that suggested that I don't have a right to go to school, allow me to tell you a little story. About ten years ago, I was working in customer service. At that time, I was a young father of three earning less than $25,000 a year. Realizing that I needed to change my financial life (because very few families of five can get by on less than $25K a year), I took a year and spent about $3,000 to enroll in a certificate program in computer programming. Yes, I was receiving tuition breaks at the time (as you can imagine with that salary), but I chose to make the investment in my future. Thanks to that investment, not only do I have a much better salary now, but I have been able to pay more to my kids' schools. Yes, I suppose you could make the case that I should have given the money to the schools, but as it turns out, the schools have benefited far more than the $3,000 I spent. The megillah does belong to me. I won it in a Chinese Auction about fifteen years ago. I get extensive use out of it. I don't think that the money I spent on the auction fifteen years ago has any relevance to the here and now. The camera *was* purchased by me a few years ago. Yes, it was a luxury, but a rather rare one. I'm willing to accept some criticism from those who say I shouldn't have bought it -- but not from those who say that I shouldn't spend time with it now that I have it. Those people who would begrudge me the time I spend shooting pictures, all I can really say is "get a life." I don't have to justify to you (or anyone else) if I spend a few minutes doing something I enjoy. The fact of the matter is that we all need diversions -- for me, it happens to be photography. Everyone needs to have some enjoyment in life and everyone is entitled (within reason) to pursue his/her hobbies. I don't think the few minutes or so that I spend shooting pictures is harming anyone. If you disagree, then so be it - but I don't have to justify it to you. I thank all those who stood up in my defense. I also thank those participated in a civil manner - even if they were critical of me. For those who chose to attack, well, I suppose there's nothing I can say that will make you happy anyway. I'm not going to allow comments on this post either. If you want to discuss the original issue or this post, feel free to email me. I can't promise I'll respond to everyone (I am fairly busy), but if you're willing to discuss things civilly, I'll try to respond. I'm curious to know what my readership thinks. Perhaps I'm in the wrong on this matter. I have a son enrolled in a yeshiva. Due to various misunderstandings and error on both my part and the yeshiva's part, we did not fill out the financial aid forms for this year. As a result, we're paying full tuition for one kid. Fine -- it's difficult, but we'll somehow get by. I'm not going to hold the school responsible because we didn't fill out the forms. However, there was one particular part of the application that really bugged me and I was hoping for my readership's feedback. One of the things that the school requested was copies of all our bank statement/credit card statements/etc. for the previous two or three months. This is something that no other school (in my experience) has asked for when evaluating financial need. No school, except this one, has asked for actual statements from accounts. Truth to tell, I find this highly invasive. I don't think it's their business which grocery store I shop at, which doctors I see, and, for the little discretionary spending that I do, where I do it. I feel violated even at the thought of them going through my statements and saying "Hmmm... he spent $10 at Barnes & Noble," or "He didn't *really* need to buy that $15 bouquet at the florist," or "Hey, what's this $10 charge at Hallmark?" I have no problem providing them with totals and aggregates of our spending (including the amount of discretionary spending) by category, but I just can't help but feel that requesting the details of our individual transactions is both intrusive and invasive -- especially since no other school has ever asked this of us. What do you think? Am I being bent out of shape over this? Is their request reasonable and I'm just being defensive? Or is it truly over the line and overly invasive? You Canna Change The Laws of Physics... er, Economics. An interesting article appeared on Yeshiva World News today concerning the problem of prospective grooms asking for excessive amounts of money to marry. Many of the young men in Israel who are learning in yeshivos are demanding that their prospective fathers-in-law to buy them an apartment before they will agree to a marriage. 1. Most chareidi families in Israel (which is the segment of the population that we're talking about here) have large families. Since, on average, half of those children are daughters, most families are looking at buying at least three apartments (if not more) for their prospective sons-in-law. 2. Most of these families are barely squeaking by financially. Most chareidi families have lots of kids and spend years paying for private education for those kids, In addition, since secular learning is, for the most part, verboten, many of the ones who are employed are earning wages that are typically found in the unskilled labor market. Yes, there are some who are making it financially -- but those are the exceptions, not the norm. 3. They have educated their daughters that the only "acceptable" choice for a husband is someone who is going to sit and learn for an indefinite time into their marriage. Anything else is substandard and not befitting for a Jewish girl. This message is pounded into their heads by their teachers from the time they are old enough to even think of marriage. As anyone who has studied a basic economics course knows, there are the concepts known as supply and demand. When there is excess supply and/or little demand for any particular item, the price of the item falls. Likewise, when supply is scarce and/or demand is high, the price of the item will rise. What has happened, very simply, is that over the last thirty years or so, we've increased the demand of a learning groom to the point where, once free market forces take effect, there is a rise in general prices -- not only on the best learners, but even those of lesser capability. As a result, even boys who aren't the best learners are demanding the purchase of an apartment. Lord alone knows what the true best learners* are asking for. Rav Chaim Shlita used the opportunity to discuss the trend with young chasanim requesting an apartment before wedding arrangements are even finalized, the weekly BaKehilla reports. The Rav explained that he receives telephone calls from mothers of young girls, explaining they want an apartment and as a result, there cannot be a shidduch since they simply cannot accommodate. “It has crossed acceptable boundaries. Today, every bachur who learns four or five years believes he has attained a level of worth higher than his father-in-law and therefore, he is entitled to an apartment. We must fight this trend. A fast day must be declared to stop this epidemic”. The Rav called on roshei yeshiva to combat this trend and to use their influence with talmidim to begin turning this around. He added that at most, one may request half of the cost of an apartment from each side, but that is the limit. It's good that Rav Eliyashiv Kanievsky is bringing attention to this situation. But a fast is not going to solve the problem. Nor will imposing a price cap of half an apartment. As most people know, price caps generally do not work -- especially in environments where there is no enforcement mechanism. I don't believe that grooms will continue to ask for less. On the contrary, they will continue to ask for more -- until they reach the point where demand is going to fall because not enough people will be able to afford the price. I believe we may be approaching that point very soon. At some point, the fathers are going to rebel and not pay -- if not from anger then from the sheer inability to pay. When that happens, the market will collapse. Ultimately, it may take Adam Smith's invisible hand to undo the distortions in the dowry market that chareidi society has created over the last thirty years. * Of course, one could make the argument that the true best learners might also be the best ba'al midos and know what their prospective in-laws can afford. But that's another story for another time. The annual discussion of whether or not it is proper to go to a hotel for Pesach has once again reared its head -- this time in the YWN coffeeroom. Personally, I don't see what the big deal is. Eeees and I don't go away and, truthfully, cannot picture it. For us, Pesach has always meant staying at home (or with friends or family). Even if we had the money to go away we probably wouldn't. But that's just us. For others, going away for Pesach is "their thing," and I just don't see anything wrong with it. Every year I hear all sorts of arguments against the practice, but I have yet to find one that makes any sense. Two years ago, Dayan Shalom Friedman suggested that it's wrong to go away because you won't clean your house. I posted about that at the time and showed how that argument was totally without merit. With so many people out of work, and people needing to take from Tomche Shabbos to put food on the table, wouldn't it be tremendous if every person took the thousands of dollars they spend on a hotel and gave it to tzedakos that need it desperately? 1. I think it's a bit galling to tell people what to do with their money. The commentator has no idea how much tzedaka the people who go to hotels give. Perhaps they've already met their obligations regarding tzedaka? Who is he to tell them that they have no right to spend some money on self-enjoyment? 2. The commentator is worried about people out of work, but he doesn't seem to realize that by closing down the Pesach hotel industry, a lot of people will be thrown out of work. I'm fairly certain that this provides a nice chunk of the annual salary for a number of people. 3. Why stop at Pesach hotels? Why not tell people to buy the cheapest esrog they can find for Succos and put the rest towards Tomche Shabbos? Does he take his kids on a trip on Chol HaMoed? Perhaps he should cancel the trip and explain to his kids that others need the money more. Does he buy flowers for his wife on Shabbos? Perhaps he can do with a single stem (or none at all) and give the rest to tzedaka? Who *really* needs music and flowers by a wedding? A wedding can be perfectly, 100% kosher according to all opinions without them. Perhaps that should be given to tzedaka too? And on and on it goes. In other words, if you're going to tell people they can't spend money on X because it can be put to better use in charity, then why not carry it to its logical conclusion and simply say that everyone must turn over every discretionary penny they have. Of course that's not what the commentator meant, but why not apply his principle there as well? Of course, the more I think about it, the more I come to realize that perhaps going away to a hotel for Pesach *is* the authentic Jewish thing to do. After all, in the times of the Beis Mikdash, you went away for Pesach *every* year (unless you lived in Yerushalayim). There was a violent confrontation at the Kotel (Western Wall) today. The Women of the Wall, a women's group that prays there on Rosh Chodesh, complete with talleisim and tefillin, were preparing to daven when two people began throwing chairs at them. Fortunately, no one was hurt. Police arrested two people for the violence. I really don't want to get into the whole controversy regarding the Women of the Wall. I don't know enough about the motivations of the women or of those that oppose them -- not to mention the possible halachic issues to form an opinion on the matter. Except for putting on tefillin on Rosh Chodesh, do they observe any other of the 613 commandments of the Torah? Do they keep kosher? What about Shabbat? When did they stop driving to the beach on Shabbat and Chagim? Do they cover their hair with a kipah and on Shabbat do they wear a shtreimel? Pretty strong insinuation, no? Because they want to daven with talleisim and tefillin by the Kotel, they obviously don't keep any other mitzvos. And yet, can you imagine the same person saying the same thing about people who steal, defraud or molest children? Would he say the same thing about Kolko any of the other criminals that (sadly) would be welcome in most minyanim? Kind of makes you wonder -- do they really think that a group of women davening with tallesim and tefillin are worse than child molesters? UPDATE (12:00 PM): Of course, my comment to this effect on the YWN article didn't make it past the editors. What Happened To My Old Blogger Comments? I was just reading an old post of mine and I noticed that there were no comments on the post. I know that that was odd because I *remember* receiving comments on that post. Looking further, I see that none of my pre-May 2006 posts have comments. They're all just... gone. Does anyone else have this problem on their blog? Do you know the cause? Allow me to introduce you to Shimon. Shimon is a fellow who davens in a shul in my neighborhood. I only know Shimon by sight -- to the point where I have no idea what his name actually is (for all I know, it really could be Shimon). He seems to be an affable fellow -- he comes to shul with a smile on his face and is well-liked by his fellow congregants. I've never seen him upset about anything. He sits in the back of the shul with a few friends. This past Friday night, I was davening in that selfsame shul. Although I don't normally daven in that shul, I do find myself there on Friday nights sometimes - very often sitting near or next to Shimon. This past Friday night, Shimon came in late -- and when I say late, I mean very late. He arrived at shul after Borchu. OK, so he came late -- we all do it from time to time. Perhaps he had some minor emergency that needed to be taken care of. Perhaps he was helping someone else with last-minute Shabbos preparations. Let's be dan l'kaf z'chus here. After he arrives and grabs a siddur, he then proceeds to quickly daven Mincha, opens his siddur to Kabbolos Shabbos, davens a paragraph or two -- and then begin talking to three other people at the same table. And so it goes -- he quickly davens a paragraph or two and then goes back to the conversation. Through all this, in the time that the congregation davened Ma'ariv, he davened Mincha, Kabbolos Shabbos and Ma'ariv -- and spent about 50% of the time talking to his neighbors. Finally, after davening, he gets ready to leave. He grabs his siddur and heads to the bookcases and doors. His friend reaches for the hand that holds his siddur. "Just leave it there for tomorrow morning," he says. "No," replies Shimon. "It's a segulah for parnassah to put your siddur away after davening." Now, I have no idea if this is a legitimate segulah or not -- but let's say, for the sake of argument, that is. Talk about missing the forest for the trees! He arrives late to davening, barely prays at all -- and when he does he interrupts it with unnecessary conversation -- and then thinks that putting his siddur back on the shelf is somehow going to grant him extra income. How about spending more time and attention and showing greater respect to the prayers and the One to whom you are praying? It's Him -- not the siddur on the shelf -- that provides your parnassah. I somehow find it hard to believe that God looks favorably on the act of putting the siddur back on the shelf after showing active disrespect for God, His prayers and services and the fellow congregants who are trying to daven undisturbed by unnecessary conversation. I'd be willing to bet dollars to doughnuts that God would be far more pleased if you arrived on time, didn't talk through davening and simply left your siddur on the table at the end of davening. After seeing the cover of this week's Mishpacha, I couldn't help but think that perhaps Kent Brockman was a prophet when he foresaw this years ago. I had a bit of time on Purim, so I decided to attempt a still life. Canon XSi, 18-55mm lens at 27mm, f/22, 1/4 second, ISO 800. Critiques, comments and criticisms are welcome, encouraged and appreciated. Someone who is near and dear to me is going to have major surgery today. If anyone is willing, please spare a few minutes to say some tehillim or have some good thoughts for Moshe Mendel ben Yehudis. I would greatly appreciate it.